Jeanne Mosure, Canfield, Ohio native and former senior vice president and group global publisher of Disney Publishing Worldwide, will serve as the Williamson College of Business Administration’s first executive in residence. 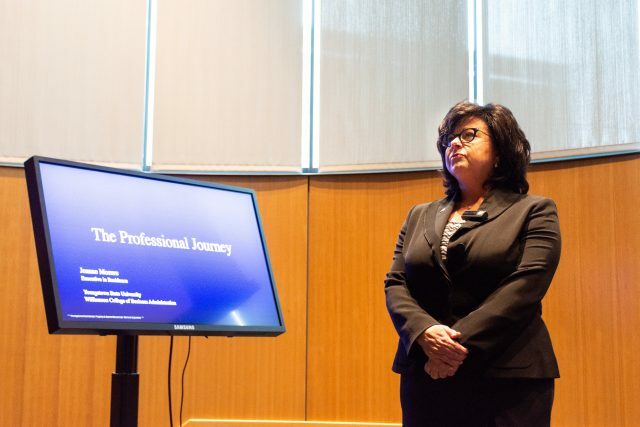 Mosure showcased a public keynote, “The Professional Journey,” in Williamson Hall on Jan. 23 for Youngstown State University students and community members to get to know Mosure and the resources she can provide to students. Betty Jo Licata, dean of the Williamson College, said Mosure’s role will evolve over time, but is focused around helping students. “We wanted to bring [Mosure] in to provide some mentoring to our students and to have an opportunity to meet and talk [with students],” Licata said. After living in New York City and Los Angeles, Mosure returned to her Mahoning Valley roots in 2017 to be close to her family. Mosure credits Licata and YSU President Jim Tressel for making her role at WCBA possible. “Now I can say I’m ‘Y and Proud,’” she told the audience. After graduating college from Kent State University during the collapse of the steel mills, Mosure rode a bus to New York City to begin her career. “As soon as I got off that bus in New York City, I knew that was the place I wanted to be,” she said. Mosure worked for Penguin Random House publishing company until 1998 when she accepted a position for Disney Publishing Worldwide where she moved through various management positions in consulting, sales and marketing. “What became clear to me was through every person who believed in me there was some luck, but if I wasn’t prepared for that luck it wouldn’t have happened,” she said. She managed over 300 employees through Disney company changes such as gaining ownership of Pixar, Marvel and Star Wars. “I’ve always loved the dynamic of books,” Mosure said. Lydia Walls, a senior at Warren G. Harding High School, attended the lecture for a class. “As part of my exploring business class, I have to go to a couple lectures and this one sounded interesting,” she said. Walls said she enjoyed Mosure’s presentation. “I thought it was a really cool opportunity to hear about how she was able to kind of start from nothing and build a whole career,” she said. Currently, Mosure is vice president of public affairs at MS Consultants Inc. and remains a publishing consultant for global companies. Mosure also serves on the Youngstown/Warren Regional Chamber and Government Affairs Committee, and she is a member of the Rotary Club of Canfield and an advisory board member of the Newman Center. Mosure suggests YSU students find what makes them unique to an organization, learn from their peers, do the work, expose themselves to smart people, listen and recalibrate.